Parry Gentian is a member of the Gentian Family. The plant grows to 16 inches in height and has smooth, leathery, dark green leaves that grow in pairs on opposite sides of the stem to 1.5 inches in length. The plant grows in alpine and sub-alpine meadows at elevations between 8500-11500 feet. 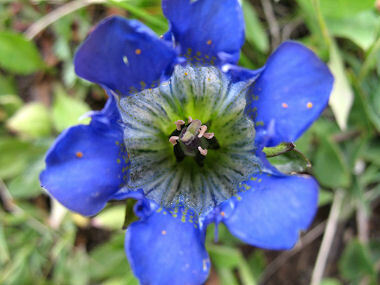 Flowers of the Parry Gentian grow in clusters of 1 to 5. Parry Gentian blooms between August and September and produces a deep blue flower with a white and green center with 5 petals to 2 inches in length.